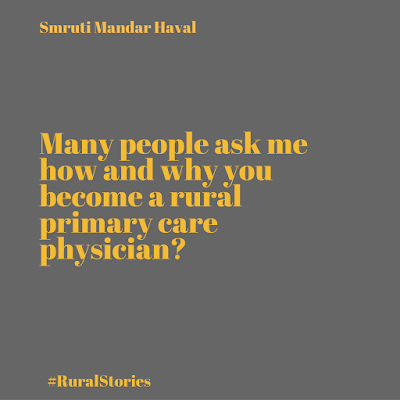 Rural Health Success Stories: Rural female primary care physician- By choice? 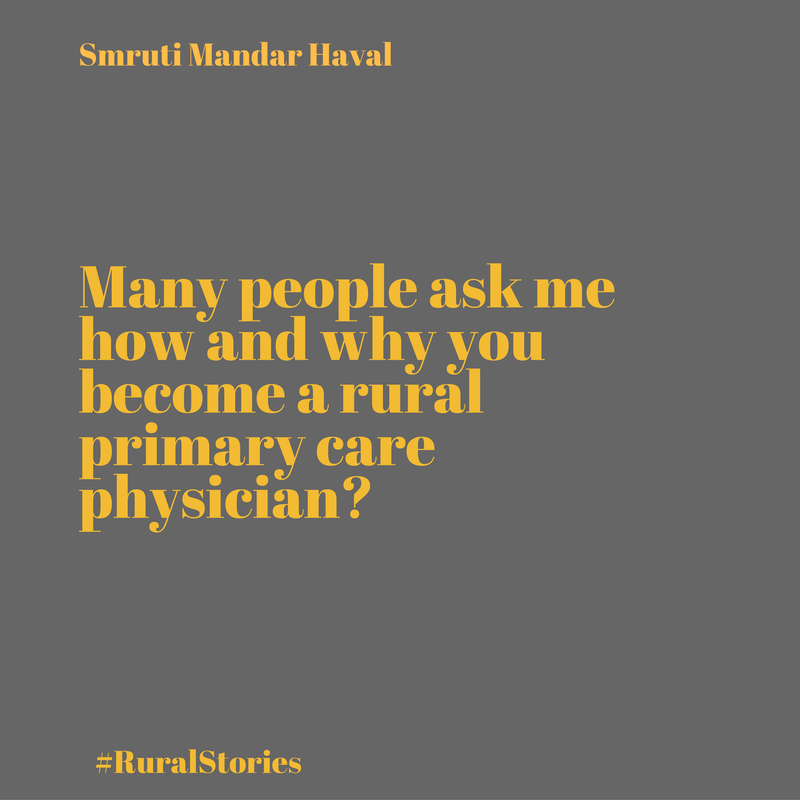 Many people ask me how and why you become a rural primary care physician? Is it by choice or a circumstantial decision? So to get answers to these questions let me share little bit of background of mine. I Dr. Smruti Subhash Nikumbh now known as Dr. Smruti Mandar Haval is a daughter of Dr. Subhash K. Nikumbh & Dr. Usha Nikumbh. My parents are specialist in their own subjects (Obstetrics Gynaecology & Ophthalmology) respectively. They are practising in area named Chalisgaon, Dist Jalgaon a town with population of 1 lakh to 2 lakh now with a good rural area surrounding it. When my parents started their practice 32 years back the population was round 40000 and most of the patients used to be farmers, poor daily wagers with not so good paying capacity. Most of the consultations used to be charity service. The connectivity was also poor then to the town. Patients used to come on bullock cart, cycle, walking. Ambulance service was a fancy thing. Maternal and child mortality was a regular thing. Laboratory facilities were in very primitive stage. With so many challenges my parents started their practice and with their good clinical judgement they managed to improve overall mortality and morbidity of patients from that area. Health promotion and awareness was always a part of their consultations. Since childhood I have observed their moves - conservative approach, no unnecessary surgeries, IV fluids, antibiotics abuse as that of today’s era. This entire thing nurtured a family physician in me and I learnt to live with people of golden heart. 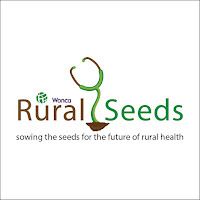 This journey with my parents generate a kind of liking in me for rural health, it’s up liftment, challenges. With God’s grace and wish I got family medicine as my post graduate course and carrier. Also I got married to a man who has his work place in a small developing town of population 50000 -60000. For me this new work place is like my own home town 15-20 years back. After looking back at my 2 years of journey of rural physician I feel my challenges are same as of my parents but I love my job as patients I deal here are same as of my childhood pure mind, golden heart with lots of faith in me. They do feel I have healing hands. Their trust act as placebo in my treatment plan. For my residency & undergraduate training I have stayed in urban and metro areas. Those 10 years taught me how urbanisation changing human psychology. There I mate various types of patients like Google masters, self-diagnosis specialists, doctor shopping freak etc. This work culture was just not suitable for me. May be I was still a country side gal. Hence as soon as I finished my studies I decided to come back to my routes the rural practice. Here I diagnose patients with minimal investigations, cost effective medicines, no much branding of pharmacy companies. This job gives me lots of satisfaction of work and my dues are getting clear slowly towards community I live. I also run few projects to improve treatment compliance of my patients to their long term treatment. In these activities we make sure that they will receive best treatment with each visit, investigations done by me. Slowly & steadily I am working on up liftment of health of my community. Being a female I can relate well with both male and female patients. Female patients open up about their problems much better & clear so with that I can help them in best way. 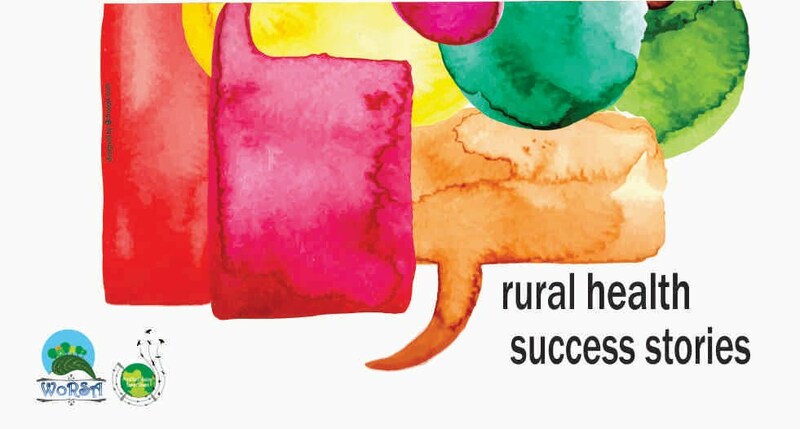 I am thankful now that I got connected to various rural GP networks all over world via rural café, rural health stories etc initiatives. Learning a lot from these activities. I am a proud # Rural Female GP by choice and I am loving it. Thank you Almighty for all guidance & strength. Congratulations. A nice write up. Very true close to heart and inspiring. Great going Dr. Smruti. Keep it up!